The classy, elegant, neutral-colored Sibyl Comforter Set will enhance your bedroom beautifully and charmingly. The alluring set features a tan floral pattern with auburn brown and chocolate brown trim. 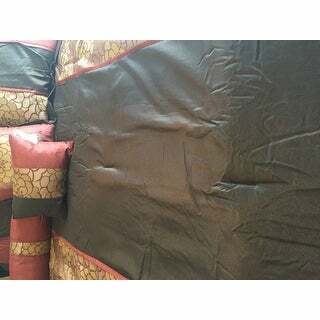 This plush Bedding Set comes with a fashionable comforter, two shams, a bedskirt and three decorative pillows. Loved the fill of this comforter set. Quilt is heavy and warm. Sheets are soft and comfortable to sleep on. Also included with the set were throw pillows which completed the set. Many compliments on this set. This comforter is the epitome of why you shouldn't buy a cheap comforter. I'm not trying to sound bitter and I never write reviews, but this one deserved one! I read some reviews before buying the product just like most people do, but when I saw the negative reviews I didn't think anything of it and I thought that people were just complaining for no reason, and oh I was wrong. Upon first opening this I thought that the colors were very vibrant and it was the color scheme that I was looking for in my room anyway, but about a week after receiving it and actually using it the threads began to start tearing which exposed the cotton. Not to mention about a week after that the pillow sham threads started to rip too exposing my pillows, also whatever fabric that was used to make it hurt my face it's way too rough. It found its way in the garbage where it belonged along with the shams; the only things that I were actually able to keep were the throw pillows, and the bed skirt. I just decided to buy a more expensive comforter with the same color scheme that hasn't ripped yet because it wasn't made poorly. The bottom line to this review/rant is just don't buy this in my opinion unless you're looking to waste money. While the color was a nice match for what I was looking for, the quality was actually my concern. I suppose you get what you pay for and when you spend under *** for a comforter set, you are not going to get the quality you would like. I have not had this for very long and the seams on the comforter are already coming apart. I'll be shopping for something different soon and will chalk this up as a lesson learned. This was a return item because did not met my expectations. I returned it because the comforter was not wide enough. I've owned this product for less than a year. The comforter has started to come apart at the seams. Shoddy workmanship is an understatement. When I brought this to Overstock's attention, they stated it was outside of the "return" window and I'm stuck with it. This comforter set was part of a larger order including a "solid wood" headboard that turned out to be a nightmare. Although Overstock did resolve the issue with the headboard it is becoming apparent this retailer handles a lot of Chinese made junk that doesn't hold up under normal use. I urged them to drop the headboard from their catalog but it remains (their computerized email program keeps sending me emails trying to sell me the thing all over again). Overstock has been my "first stop" for online shopping but not any more. WARNING: read the customer reviews, check the ratings and consider the country of origin before making a purchase. You can easily be left holding the bag or put through the ringer with returns of inferior products. Also, after a purchase, get ready to be assaulted multiple times a day with e-mails. Really enjoying the 7 - piece Bedding Comforter Set, it feels good, looks good and easy to maintain. It was a good choice and I would recommend it to anyone looking for a nice affordable easy maintenance comforter set. With all of those pieces, it makes the bed & the room look like a store display that I can take credit for putting it all together myself. Cheap material. Pillows are flimsy. Beautiful bedding. Glad I bought the king size set. The colors are rich, just like it is advertised. It is a decent comforter set for the price. It coordinates so well with my bedroom decor. Wish that the comforter was much thicker but again you get what you pay for. I thought for the money it might look cheap but it actually looks very nice not cheap looking at all the colors are very vibrant i am truly satisfied. Just arrived looks great and has a great feel. It adds character to any room. Pretty, but poorly made. Frayed quickly! Cheaply made. Comforter is already coming apart. I would not recommend this comforter set. "What are the dimensions for the cal. King? I have the king and it's to small for my king bed. "